Late September is always a bit of a celebration for my husband and I. In the span of a week, we smash in both birthdays and our anniversary! Sometimes we travel out-of-country (2006: Italy, 2010: Europe) and other times, we keep it a bit more low-key. This year was one that fell into the latter category. This year’s trip was checking one of my husband’s Japan To-Do’s, Kamikochi. 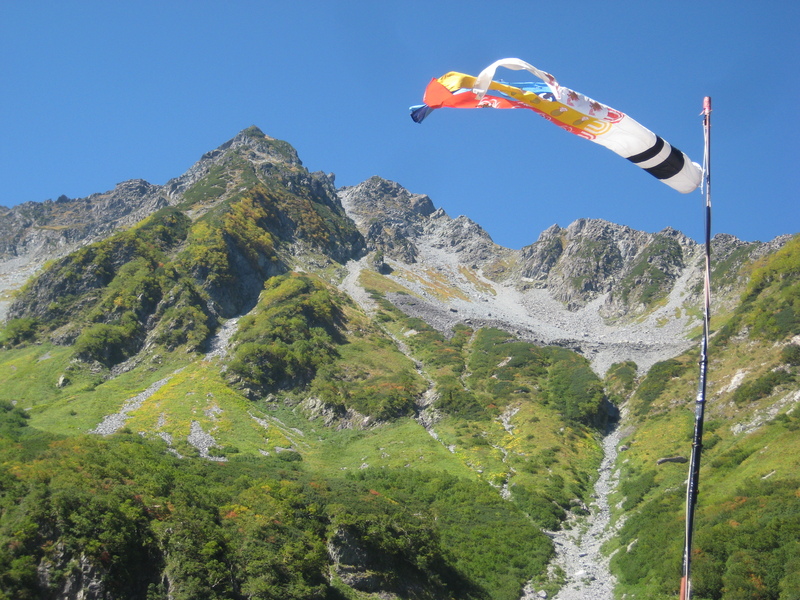 Late September is a perfect time to head into the mountains here in Japan; cool in the evenings and warm during the day. 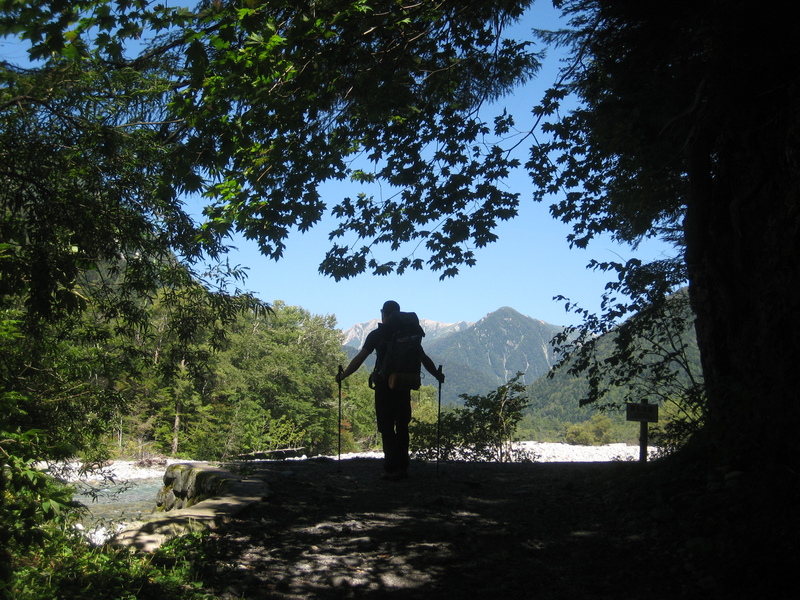 We had heard people rave about Kamikochi but didn’t quite know what to expect. 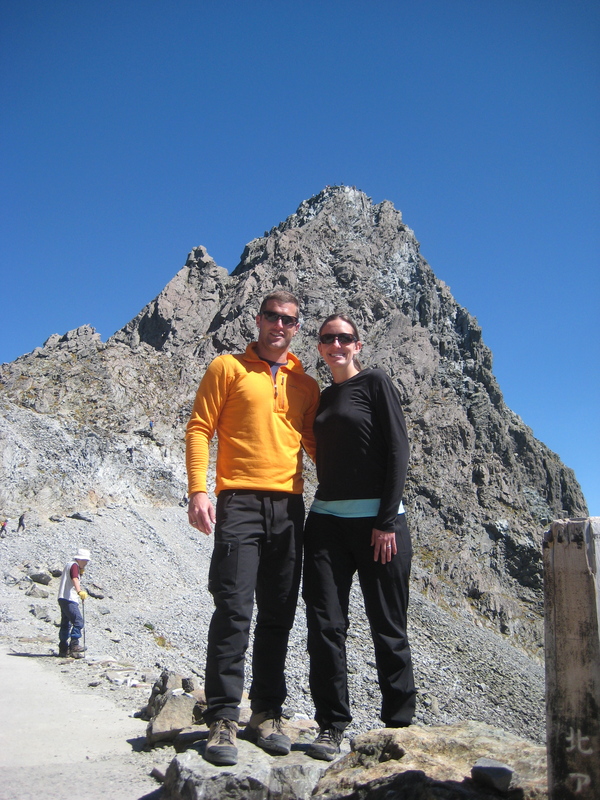 We arrived early on Wednesday and began our 17km hike into our campsite. 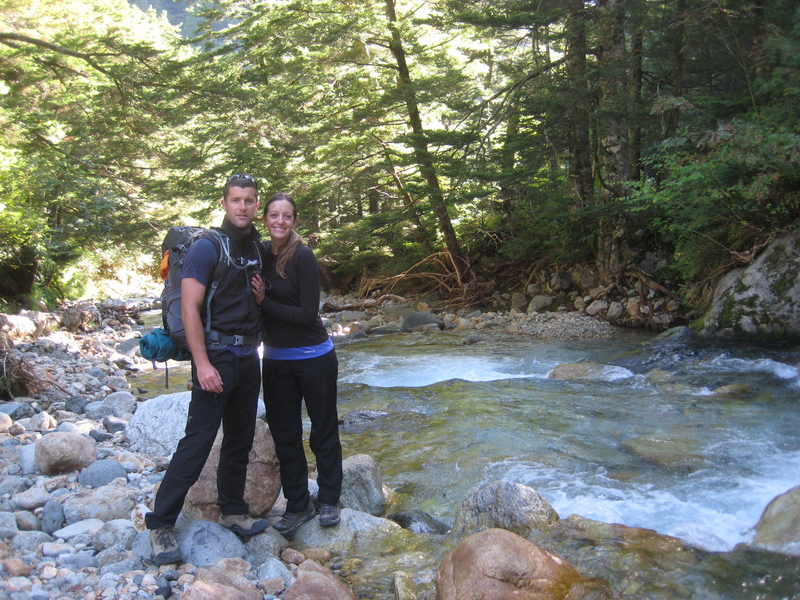 The initial 11km was a tree-covered trail with slight rolling hills that followed the river farther into the valley. There were several huts along the way where we were able to stop, use the toilet (several are pay; 100 yen each), buy some snacks or drinks, and more. In early afternoon, we finally made it to an old mountain hut site, Yarasawa, destroyed by an avalanche that is now a tent camping site. Now there’s one thing you should know about us when we camp. We eat very, very well while we’re out camping. 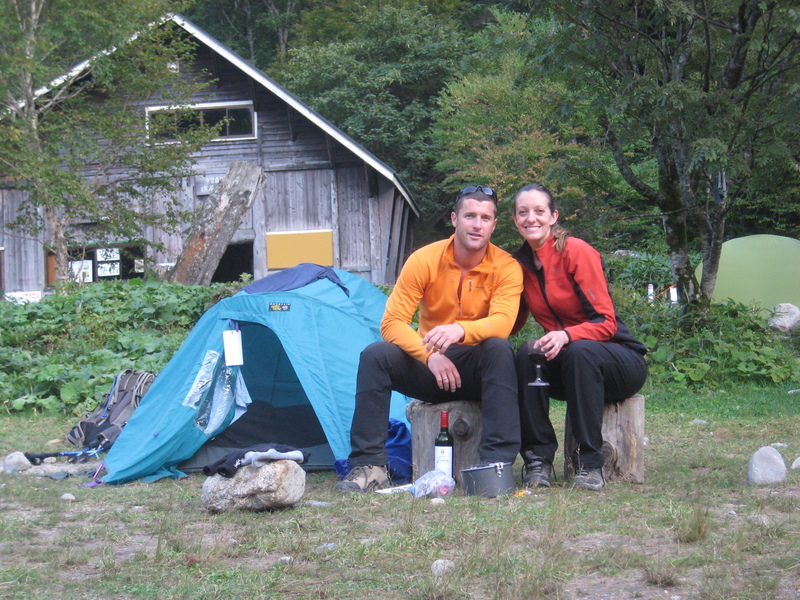 It becomes the biggest luxury on an adventure where you’re sleeping on the ground, not bathing, and hiking all day long! We have several go-to backpacking recipes but tried out a new concept recipe of an Italian-inspired soup on the first night. Actually, it contained the heaviest items so it needed to be the first to go! 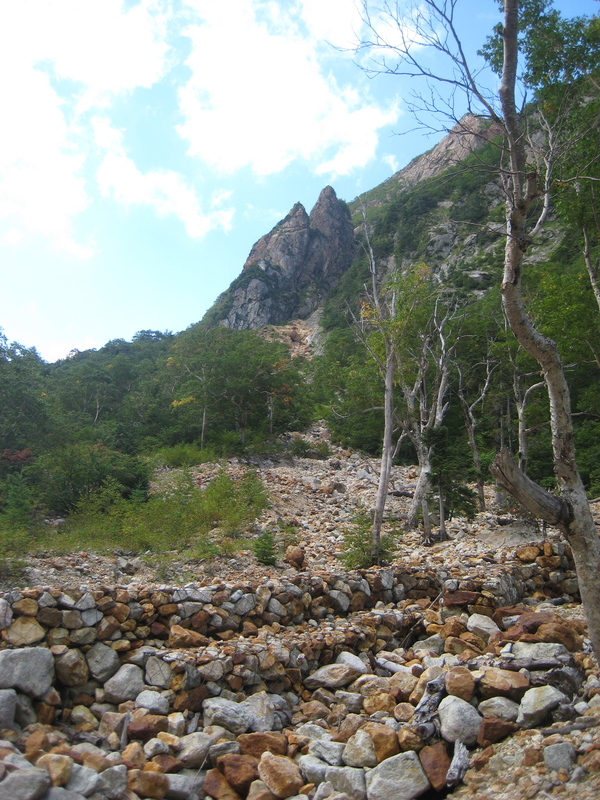 On Day 2, we headed farther up the valley and then straight up the side of the mountains to Yari-ga-take. 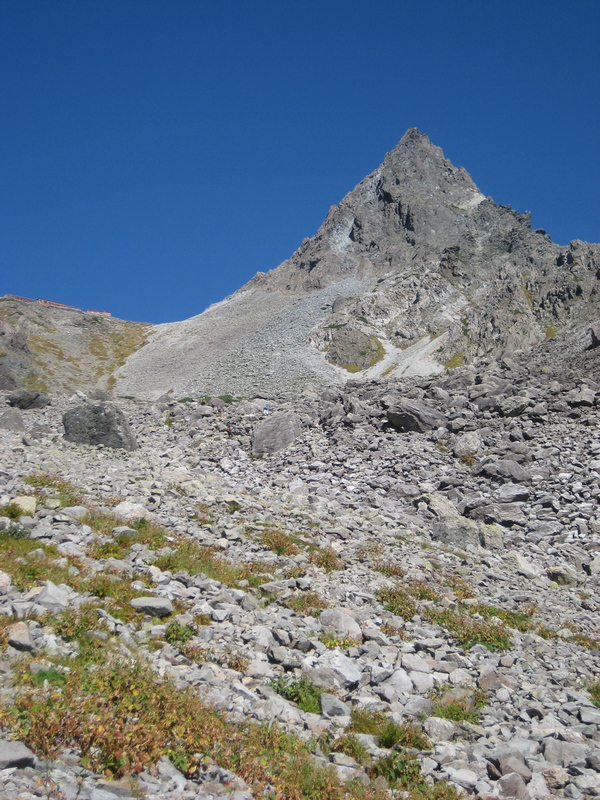 This mountain is one of the more popular mountains in the park and it shows. 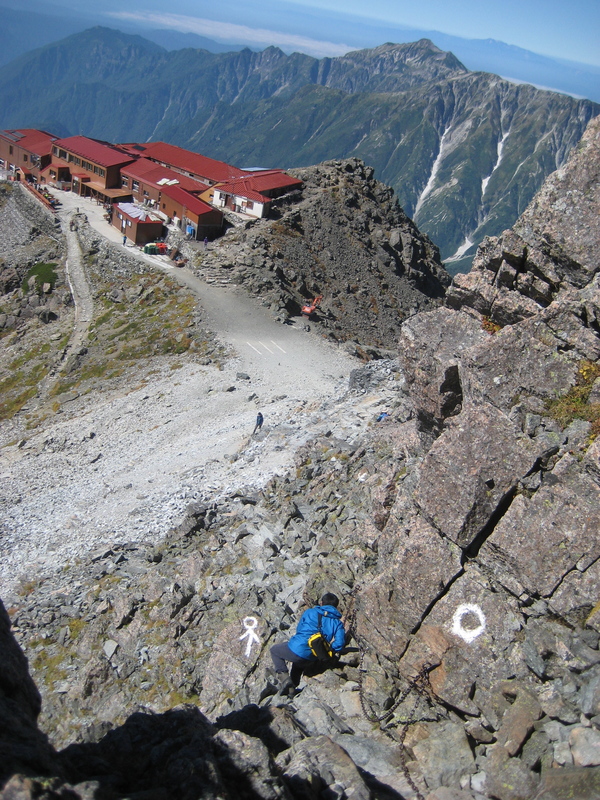 At the ridgeline just beside the peak, there is a massive mountain hut containing beds for hundreds of people, a restaurant, shop, and more. 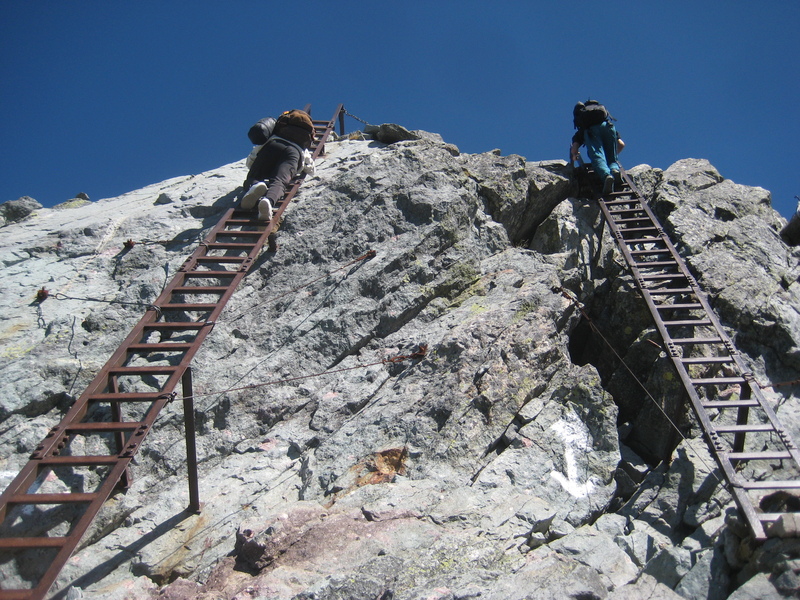 The actual peak is a sketchy climb of chains, ropes, and ladders to the top. I’ll admit that it was a peak that Tom claimed, not me. I don’t do ladders…especially when I was having slight vertigo. 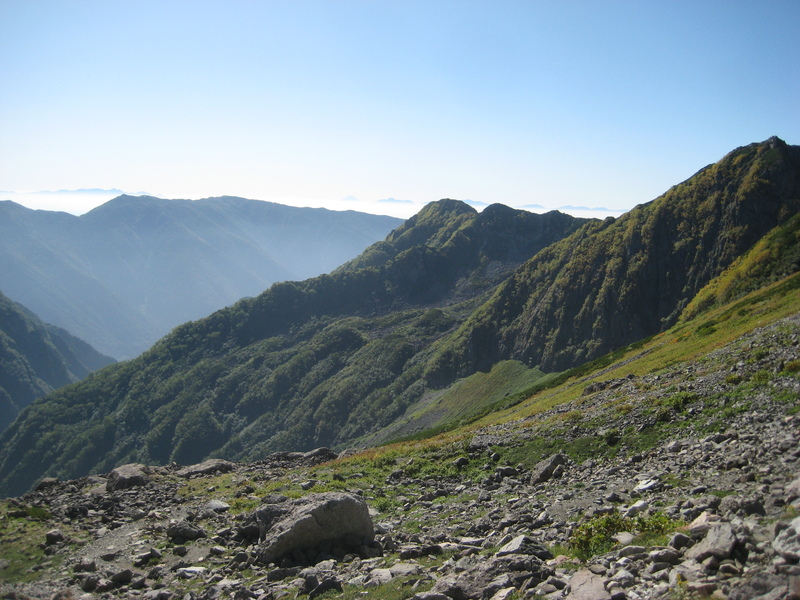 On the descent, I took the trail straight down and my husband decided to take a ridgeline hike to Tenguhara. 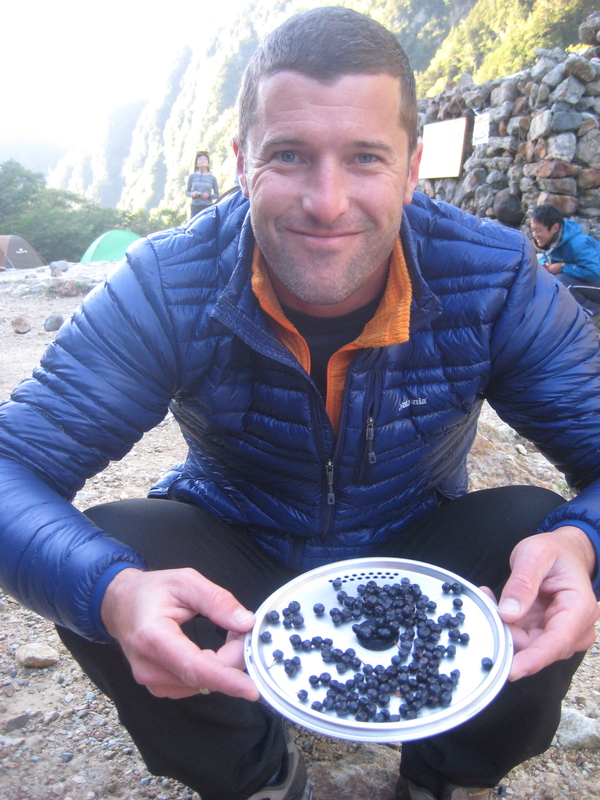 We met up at the junction point on the trail where he surprised me with mountain blueberries. Freshly picked with the blue thumb to prove it! My husband kindly took pictures on his way up Yari-ga-take peak. I hung out at the hut down below! Ladders upon ladders to reach the top! 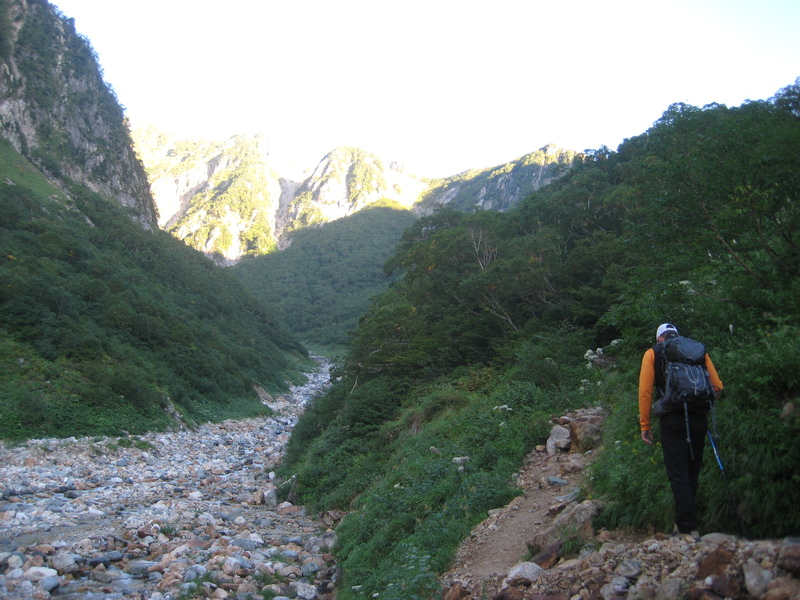 On Day 3, we packed up camp in our gorgeous little valley and did the 6 km hike back out to Yokoo-Sanso hut area. We set up our campsite, dropped unnecessary gear, and started climbing up a grueling 6km hike into the high mountain valley of Karasawa. The initial 2.5km was a beautiful, slightly uphill hike to a bridge where you crossed the river. It had great rocks to relax on, soak your feet, and sunbathe (we took full advantage of it on the way down). The second part of the hike was up, up, and up. 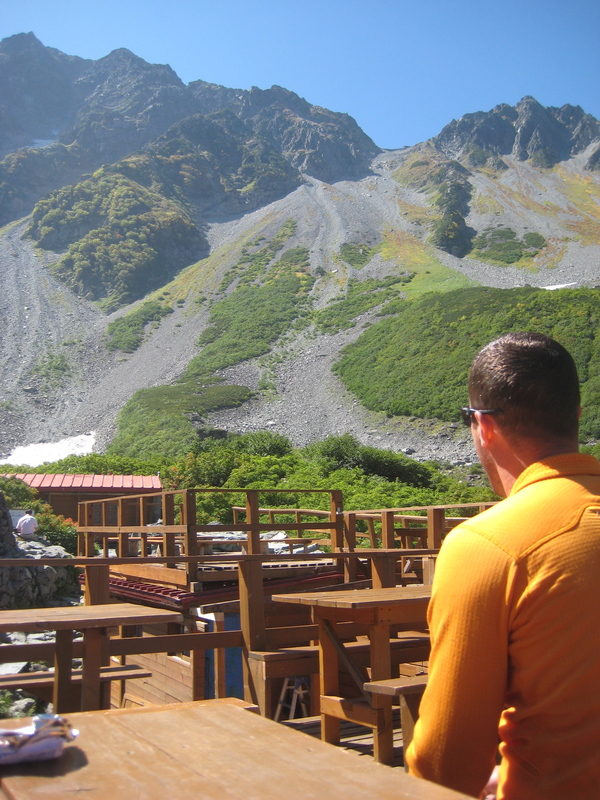 I swear my husband seems to have a thing for intense, heart-pounding hikes! Doesn’t everyone use cute bear stickies to mark the route? When we finally made it to the top after about three hours on the trail, we were rewarded with a wonderful view of the high mountain valley surrounded on three sides by exposed mountains. For being that remote, it sure did have a lot of comforts! We ordered some curry rice and enjoyed it on the roof-top eating area. The hut holds several hundred people so it was equipped with all your basic needs. Water, toilets (western with heated toilet seat), draft beers served up in large glass mugs, plenty of food and snack options, and souvenirs. After relaxing a bit, we headed back down towards our campsite. It was our final night in the backcountry (can you really say it’s backcountry when there’s hundreds of others around you?) and we wanted to enjoy our night. 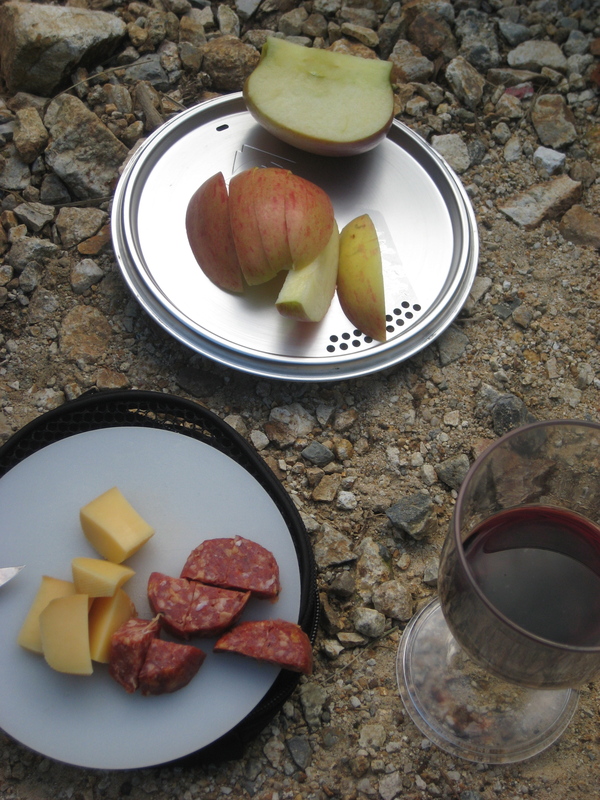 We cooked up the last of our food and enjoyed it with some wine from the local hut store. Our campsite had some fun characters so we people-watched, chatted with a mountain guide staying in our camp area, and said “hello/goodbye” with the kids camping next to us. 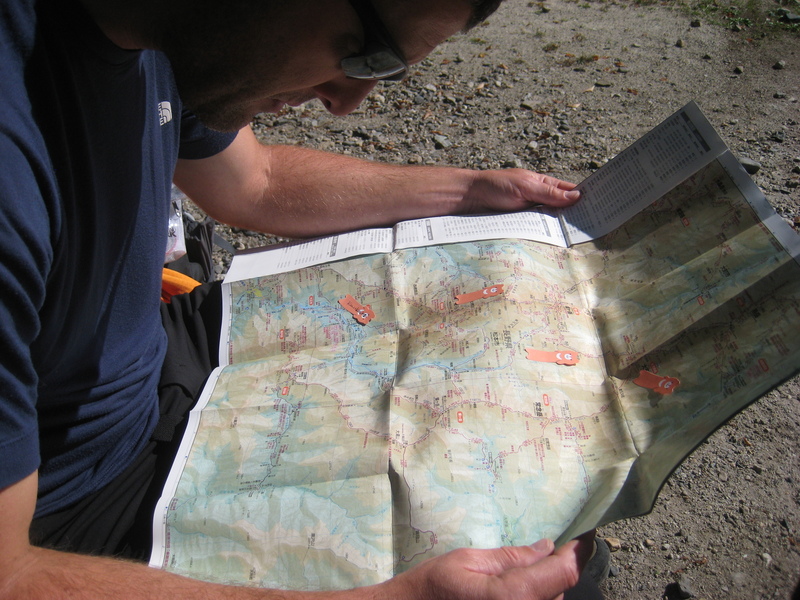 On day four, it was just packing up our camp and walking the final 11km back to the bus terminal. 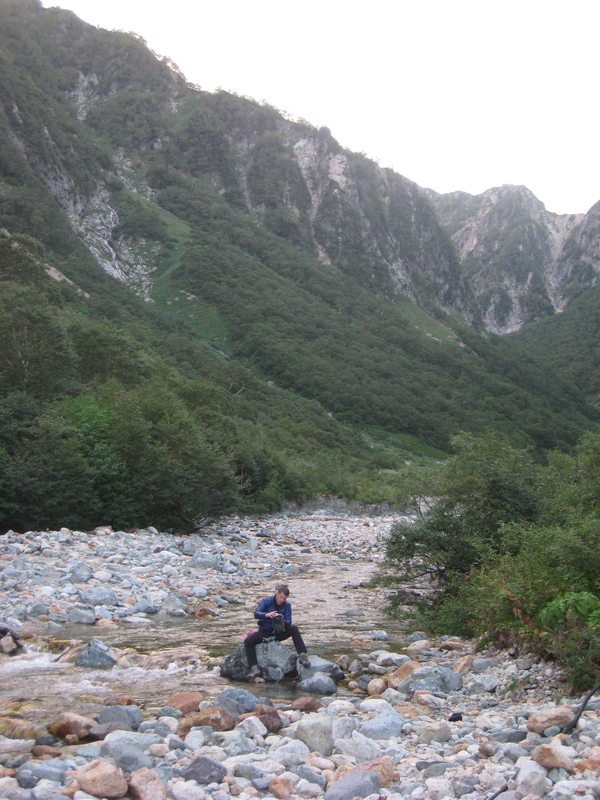 We were sad that our time in Kamikochi was ending but SOO excited for a trip to the onsen (public bath) to clean up. We made really good time on the trail back and passed hundreds of people heading into the park for the long holiday weekend. 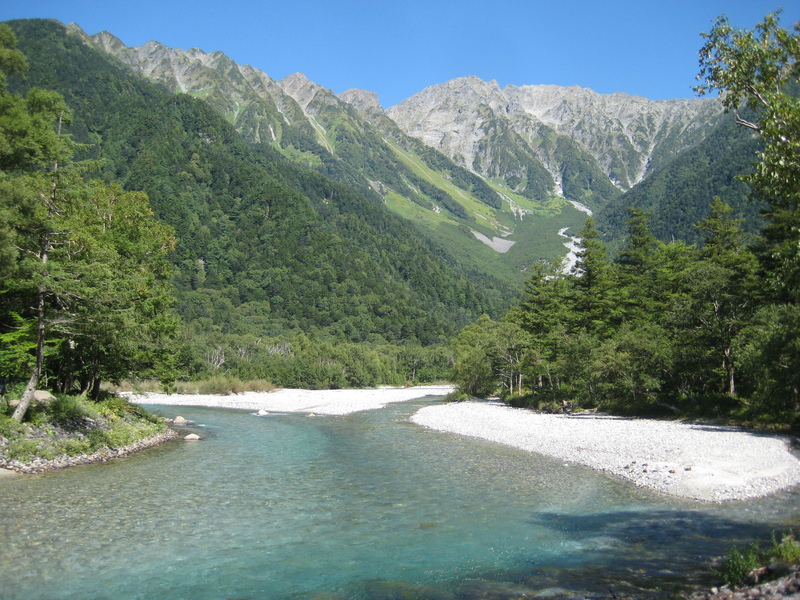 If you have the opportunity to go to Kamikochi, do it! It was gorgeous and the closest I’ve seen to an American National Park over here. 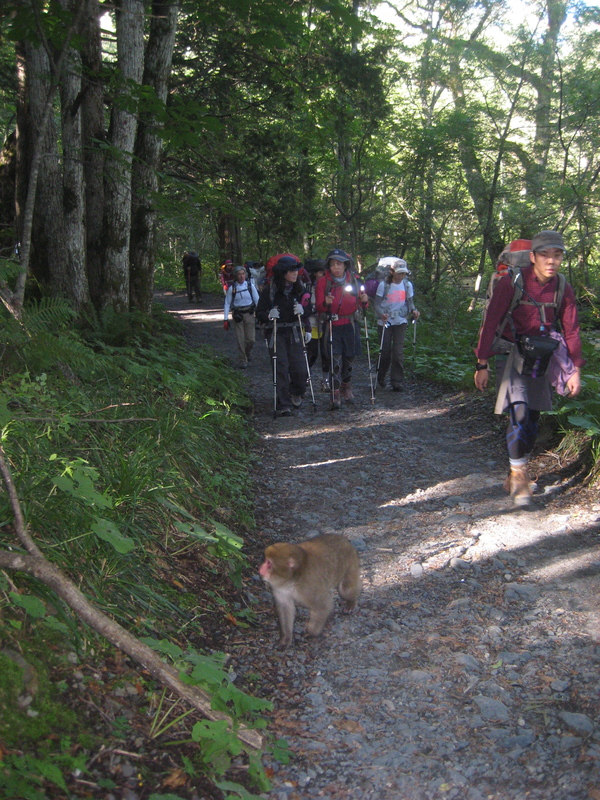 While the peaks and trails aren’t as isolated as in America, it’s a cultural experience to hang out with hundreds of your closest Japanese friends while admiring your beautiful surroundings.